Help establish a second worker-center, in North Nashville! Also, launch a training program for hotelworkers who want to organize! 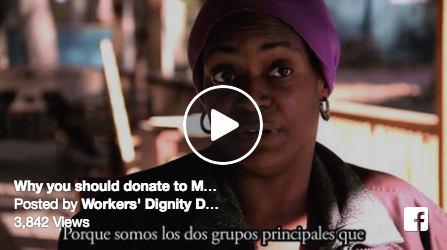 You've seen Workers' Dignity members fight, and you've seen the organization develop. Year after year, hundreds of low-wage workers have demanded economic, social, and racial justice in Nashville. We are raising $50,000 to make these two dreams a reality. Just about half of that will go towards covering the rent and set-up of the new North Nashville center, and the the other half will go towards funding the two-week training stipends for housekeepers who are part of the Just Hospitality Campaign. A second worker center in North Nashville for MCRU! Six months ago, us bus riders began to organize in earnest for a better and more equal public transportation system, as Music City Riders United (MCRU). You may have heard of some of the victories that we have won as bus riders. One of the first was getting the MTA to fix the bathrooms in both the men’s and women’s restrooms. We got MTA to put stalls in the men’s room. You read that right: before we demanded, protested, and won... men in the downtown bus center did not have any privacy to do their business. The toilets were just out there in the open. The running joke was among riders was that prison bathrooms were better than those in the bus station. That's how they treated us riders who are overwhelmingly working-class people of color. The bus riders who formed MCRU have united with hotel workers to better organize our communities. We're doing this together to help disenfranchised people, and working-class people. We are working to get the respect we deserve, because everyone should be treated equal. The organization's worker center has been in Southeast Nashville -- the heart of the immigrant and refugee community -- for six years. Opening a second place to organize out of and putting it in North Nashville will help us organize, strategize, and reach more people where most of MCRU's membership lives, so we can take up the fight for our community. Participating in our workshops, hotel workers will learn about their rights under the law and how they can work towards better pay and more fair treatment at work. Many have already identified demands that include even bigger raises, reasonable daily room quotas so that housekeepers are not overworked, and protections from rising injury rates. The workshops will take place in January and February of 2017, and $20,000 is needed to cover the stipend for participants, as well as materials, food, gas, and staff time. Can you make a gift? The average gift to Workers' Dignity is $39. More than anything, that shows you that we are committed to being funded by the community: from the hundreds of members that have donated at meetings from their pockets, to large gifts from thoughtful allies. We've never accepted government or corporate cash; we plan to become more reliant on an expanding base of donors. The fact is, without people like you, we just wouldn't be able to make these next steps a reality. Help us continue taking on bad bosses and bad government and winning victories as low-wage workers for our community. Thank you so much for your support. PS. You can find the donation form at the top of this page on the right. Thanks again! Solidarity!